Lagos State Governor, Mr. Akinwunmi Ambode (3rd right); APC Chieftain, Prince Tajudeen Olusi (2nd right); his wife, Alhaja Mariam (right); Senator Oluremi Tinubu (3rd left); Deputy Speaker, Lagos House of Assembly, Hon. Wasiu Sanni Eshinlokun (2nd left) and Senator Musiliu Obanikoro (left) during the commissioning of Prince Tajudeen Olusi Drug Rehabilitation and Skill Acquisition Centre, built by Sen. Tinubu at Ajah, on Monday, February 11, 2019. 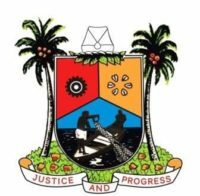 Governor Ambode assured that the facility, which would be managed by the State Government going forward, would be given topmost priority, just as he directed the Ministries of Women Affairs and Poverty Alleviation as well as Youth and Social Development to ensure that the two facilities become fully operational before May 29, 2019. He emphasized that it was important for APC candidates to emerge victorious in Saturday’s polls, saying that it would enable them continue to deliver the dividends of democracy to their constituents. 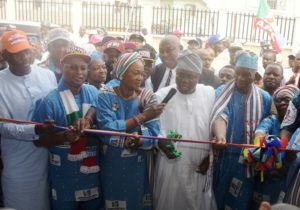 Also speaking, APC leader in Lagos Central Senatorial District, Prince Tajudeen Olusi, whom the project is named after, thanked Senator Tinubu for the kind gesture, saying it was a special honour for him to be so recognised.